If you didn't know there is option in program for exporting all notes or just one note to a file on your disk. File extension is „*.shx“. 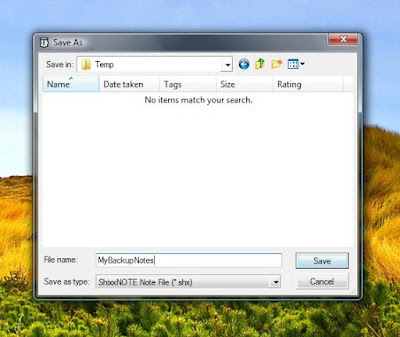 In that file program save all info about note(s) like note text, font, color, size, etc. For example maybe you have bought new computer and you want to import all note(s) from your old computer to this new one. This is very easy task. Just follow this steps. 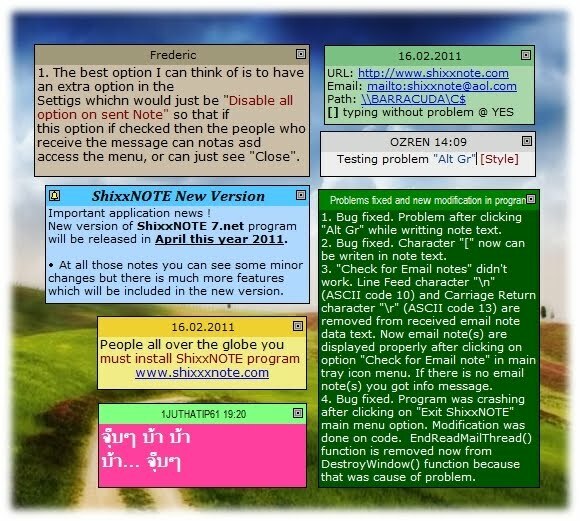 Open program main menu (right mouse click on program tray icon) and select „Export note(s)“ option from menu. See picture below. 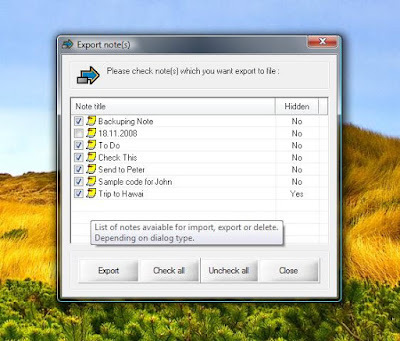 After you select option „Export note(s)“ from ShixxNOTE main menu, you will get „Export note(s)“ dialog with all notes from your desktop or hidden notes. If you want to backup (export) all notes click on button „Check all“ it will check all notes in list. If you want you can uncheck (remove) note(s) you don't want to backup. See picture below. When you are finished with checking note(s), click on „Export“ button. Then you will be prompted to write file name and to choose directory where to create ShixxNOTE program backup file („*.shx“ extension). In my case file name is „MyBackupNotes.shx“ located in „C:\Temp“ directory on my hard disc. So now you have all your notes in just one file with all data in it. After that for example copy file „C:\Temp\MyBackupNotes.shx“ to USB memory stick and copy file in some folder on new computer with ShixxNOTE installed. Now on new computer open main program menu (right mouse click on tray icon) and select „Import note(s)“ item and browse to “MyBackupNotes.shx“ ; click on button „Import“ and you will get all your exported notes on your desktop. 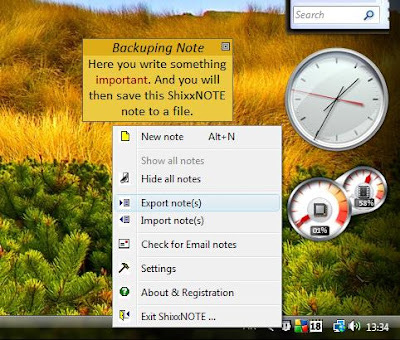 So please use this options to backup your notes or to export it from one computer to another (both computers have ShixxNOTE installed).